Pin this recipe if you want to save it to try later! One night, we were combing through the pantry trying to find something for dinner. That night, we were supposed to go out to dinner, but one of the kids was feeling under the weather, so we needed to stay home. It’s not that our pantry isn’t well stocked, it is VERY well stocked. However, sometimes when you have your mind stuck on going out for a nice restaurant meal, an old standby meal at home just doesn’t sound very appetizing! I decided to comb through some of the budget friendly recipes I had pinned on Pinterest for some inspiration. 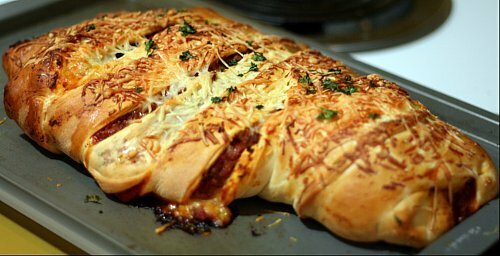 I came across this braided spaghetti bread and decided that it would be fun to tackle. Well, I’ll say that it was fun to make, but mine did not turn out as pretty or as uniform as the one pictured on the Rhodes website. In fact, mine was kind of a mess! It sure did taste good though, and I encourage you to give it a try yourself! Take your cooked spaghetti and go ahead and mix it with your ground beef and spaghetti sauce. Go ahead and place your dough on the greased baking sheet you are going to cook it on (unless you feel confident you can transfer it easily after you assemble it). 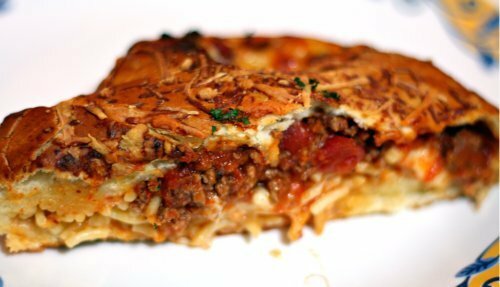 Take the spaghetti mixture and pile it lengthwise in the middle four inches of the dough. Now you are going to make cuts alongside the filling. They should be about 1 1/2 inches apart and come within 1/2 inch of the filling. Do this up and down both sides. It’s now time to “braid” your bread. 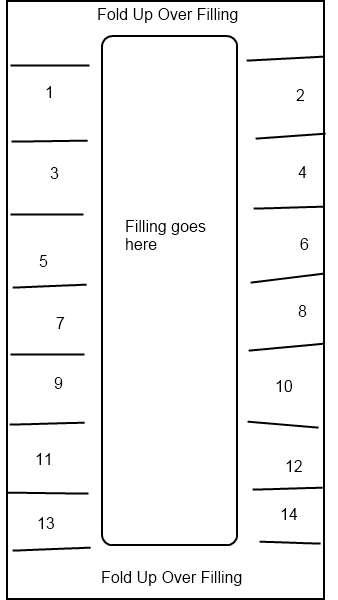 Begin by folding the top and bottom strips up over the filling. Then, alternating strips, braid left and then right over the entire loaf of bread. Brush the loaf with your egg whites. Sprinkle your Parmesan cheese and parsley over the top. Bake in your preheated oven for 30-35 minutes or until golden brown. Let sit for a few minutes before digging in! You probably won’t have 14 strips to braid with 😉 but my drawing is definitely not to scale! Make this, stick a salad with it and bam! Instant meal! NOTE: Next time I make this, I’ll probably sprinkle some sea salt over the bread before I bake it. I like salt though, for some of you, the Parmesan might be enough. This is a very versatile recipe, do what makes you happy! Be sure to check out the other frugal recipes here on Family Friendly Frugality!